Celebrate Thanksgiving at the beach this year and leave the cooking to us! Shoreline Cafe will be serving a traditional Thanksgiving plated dinner on November 22, 2018 from 4:00pm - 9:00pm. The delectable plated dinner features Thanksgiving favorites including Roast Breast of Turkey, Cornbread Stuffing, Mashed Potatoes and Gravy, Cranberry Sauce, Green Bean Casserole, and your choice of Pumpkin Pie or Pecan Pie. 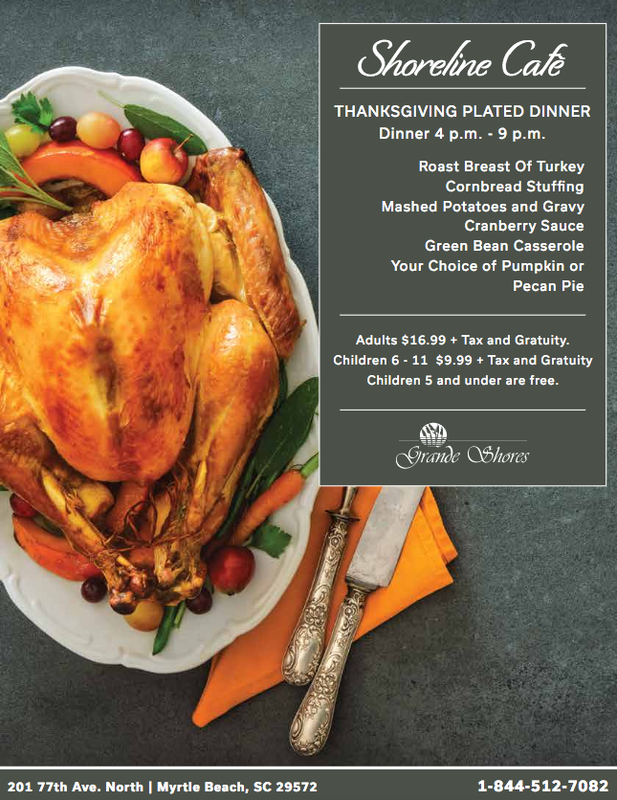 View the Thanksgiving Dinner Menu or call today to make your reservations.